Interested in Park City real estate? You have found the right place! Park City is a small resort ski town in northern Utah, just outside of Salt Lake City. Park City is well known as one of the premier ski resort towns of the Rocky Mountain West, and an amazing place to own real estate, whether it be a primary residence, second home or vacation ski-in, ski-out condo. Real estate in Park City has had its ups and downs much like the rest of the country but the market is emerging quickly due to its convenience as a vacation destination, and its craved qualities as a family friendly primary resident community. Extremely popular as a ski resort destination, Park City is home to three major ski resorts; Deer Valley, Park City and Canyons with great options for real estate choices at all three. Summers in Park City are also amazing with so much to do including fishing, boating, hiking, biking and outdoor summer concerts. With such beautiful year-round weather and amazing recreation options, more and more people are heading to Park City Utah, but only a few are fortunate enough to call Park City home. Located only 35 minutes from an international airport, Park City Utah is a very convenient destination, and in many cases you can fly there in the morning and be skiing the same day! With three ski resorts all located in one town, and eight more within an hour drive, there is no better place to visit. Homeowners have known the value of this for years, and recently Park City has become to be "discovered" with much help from the notorious Sundance Film Festival and the winter Olympics held in Salt Lake City and largely in Park City in 2002. Real Estate in Park City Utah has become more and more popular over the recent years as many more people are looking to move from metropolitan communities in search of a better quality of life for themselves and their family. Values for real estate in Park City have diminished since the height of the real estate boom in 2005-2007, yet Park City has not seen as hard a time as many other areas in the country. Park City real estate has remained a very sought after commodity, and many buyers were simply watching and waiting for the right time to buy a home or condo. While values and pricing for real estate in Park City and Deer Valley has come down, more buyers have emerged and sales of homes and condos in both Deer Valley and Park City has reached all-time highs once again. With the renewed real estate market activity, we hope to see prices and home values climb back up. The Park City Board of Realtors issues quarterly reports for real estate sales and activity and we post these reports on our real estate blog. Park City is divided into 3 main geographical areas for real estate; Deer Valley, Park City "In-Town" and Park City "Extended". Depending on the type of home or condo you are searching for, or the range in price you can spend, you may want to focus your real estate search to one of the real estate areas within greater Park City. 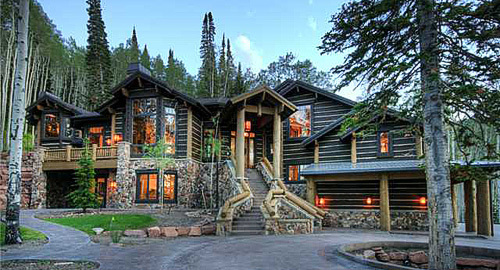 Deer Valley ski resort is a popular location for beautiful custom built luxury mountain ski homes and resort condos. Many of the homes found in Deer Valley enjoy ski-in and ski-out access directly to Deer Valley ski resort. Many homes often boast amazing views as well. To find both ski access and views is the absolute best in terms of real estate value. Deer Valley property options are the most expensive for real estate in Park City Utah, and much of that is driven by the fact that Deer Valley ski resort consistently ranks in the very top of the SKI Magazine reader's poll of the Top Ten North American Resorts List. For ski run quality, dining, service and overal atmosphere, nothing is quite like Deer Valley Resort. Real estate in Deer Valley as well as Park City has benefited tremendously! Real estate communities of Deer Valley are very close to Park City. In fact Deer Valley is just a sub-community of Park City, and the real estate options for sale have a Park City address. The local Park City Board of Realtors operates the Park City MLS and the MLS divides Deer Valley real estate into 4 areas; Deer Crest, Empire Pass, Upper Deer Valley and Lower Deer Valley. To view homes and condos for sale in Park City's Deer Valley neighborhoods you'll find links for these communities throughout this website. The Park City Board of Realtors divides the "In-Town" areas of Park City real estate into a few main communities. These include Old Town, The Aerie, Prospector, Thaynes Canyon, and Park Meadows. Depending on the type of property you are searching for; vacation condo, second home or primary residence, you'll want to focus your search on certain neighborhoods as they do offer different options to fit various lifestyles and real estate needs. Old Town Park City is probably the most popular option for buyers looking for real estate options best suited for second homes, and investment or vacation homes or condos. Park City's Old Town community is the area that surrounds popular historic Main Street and also the properties near the base of Park City ski resort and the Park City golf course. Main Street is the heart of Park City Utah. Here you'll find many options of shopping, art galleries, dining and night life. This is the true vacation location and condos and homes rent well in this area, all season long. Real estate sales and values have benefited largely by the gowth and prosperity of Park City's Main Street. Also unique to this ski town is how the Park City ski resort has the Town Lift and ski bridge that runs right down the mountain to the center of downtown Park City. This is by far the most valuable real estate location in Old Town. For any of the few homes or condos that back to the ski run and can offer true ski-in, ski-out access, these properties retain the highest value of all real estate in Park City, only surpassed by some of the more luxurious Deer Valley ski-in, ski-out homes. The Aerie is a community of Park City that offers a real estate location close to Main Street, but these homes sit well above the city and enjoy some of the best views in all of Park City. Mostly made up of single family homes, and a few townhomes, this community is home to a mix of primary residents and second homeowners. Real estate options are quite limited in The Aerie as this is a fairly small community on the top of a large dome shaped mountain. The Prospector neighborhood of Park City has a mixed bag of property, comprised of real estate options including homes, townhomes, condos, and even commercial real estate. This community is where many long time residents call home. This is also one of the less expensive places to buy a home and still be within the city limits. You can also find low priced condos for sale here within walking distance to shopping, dining, the athletic club, and the free Park City bus route runs right through this neigborhood, making it very easy to get around town. Thaynes Canyon is a neighborhood of Park City that is quite close to the base of Park City ski resort and is also the neighborhood that surrounds the Park City golf course. These homes back to the golf course and enjoy a beautiful green and serene setting. No condos in Thaynes area, and it seems as though the homes do not come up for sale too often. Real Estate choices in Thaynes area of Park City are not cheap, but are worth owning with the beautiful location and peaceful views. Park Meadows might be the most popular neighborhood for real estate choices in Park City Utah. This is Park City's favorite neighborhood and is where most residents desire to own a home. Park Meadows has real estate options that include large custom built homes, and spacious townhomes that back to the Park Meadows Country Club golf course. Many people who own property outside of Park Meadows aspire to some day make the move into Park Meadows. This Park City neighborhood is so popular becasue it is close to town, close to the ski resorts, yet is still a quiet and peaceful Park City "In-Town" location. The most sought after locations for real estate here boast big, expansive views of Deer Valley resort, and Park City resort, as well as the sparkling lights of Park City's downtown area of historic Main Street. If you are looking for the best in real estate for Park City, Park Meadows is a neighborhood to consider. 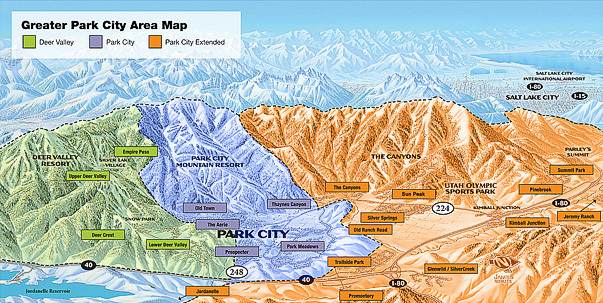 The extended neighborhoods of Park City offer many other great options and a large variety of real estate choices. From stunning luxury ski-in, ski-out homes at The Colony at The Canyons Resort to affordable condos and townhomes in Kimball Junction to family friendly neighborhoods with great schools in Pinebrook and Jeremy Ranch. Each Park City neighborhood has something unique to offer, and has a great variety of real estate choices ranging from luxury homes to affordable condos. Although these real estate areas are considered to be the "extended" area of Park City, they do all have a Park City address. If buying real estate in the "in-town" locations becomes more expensive that you would prefer, these out of town areas can offer a lot more home for the same money, and teh location is only a short drive of up to only about 10-15 minutes back into town. Real estate sales activity and values have done well in these areas as they have become more popular as the in-town locations have risen a bit too much in price for many people. Park City is not the only place to consider if you are searching for great real estate in the northern Utah mountains. There are wonderful options for property in Kamas, Oakley, Heber and Midway. These are a few of the towns and locations just outside of Park City, Utah. Kamas and oakley offer real etate choices with a more rural feel and setting, and they are only about 20 minutes out of town, so quite a short drive. The prices of homes, condos and land are quite affordable especially compared to being "in-town" in Park City. Heber and Midway real estate has grown tremendously over the last ten years as the beautiful Heber Valley has seen real estate develoment and expansion offering many more choices for people searching for an affordable home near Park City. Many residents of Park City sold property in Park City and have moved down to Heber or Midway where their money can stretch much further. It is often surprising how much more home you can get for the same money, and how inexpensive many of the real estate options are. With much more real estate development to occur, there will continue to be great choices for many years. If you are looking for real estate in Park City Utah, you must find a local Park City Realtor to help you. Salt Lake City is nearby and there are thousands of real estate agents living and working in the Salt Lake Valley. But Park City is a completely different community, sometimes it almost feels like a completely different state! If you are seraching for real estate in the Park City area, it is best to work with a realtor who lives in and works in the Park City area. 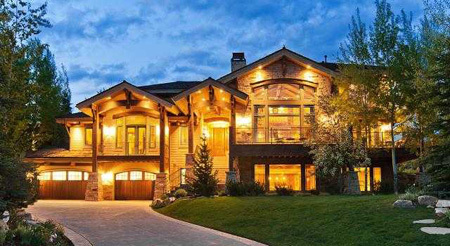 At Summit Sotheby's International Realty, most of us specialize in the Park City and Deer Valley communities. Local Park City Realtors Heather Peterson and Sean Matyja have been living in Park City for many years, and are experienced associate brokers who specialize in Park City. This website can get you started in your real estate search, and can help to educate you on the market activity and pricing trends for real estate in Park City. Once you have had time to browse around, give us a call and we'll help with recommendations on local neighborhoods, and as memebers of the Park City Board of Realtors we can access the entire Park City MLS and arrange to show you the best homes in Park City and Deer Valley. With a great selection of property, and after enjoying much succesful and responsible growth of our community, there has never been a better time to buy property in Park City Utah! Give us a call today to get started in your Park City real estate search: (435) 901-2158.